The Shooting Stars Activity is part of a set of Activities known as Distractions and Diversions. Unlike normal Activities, you need to follow these games around RuneScape. 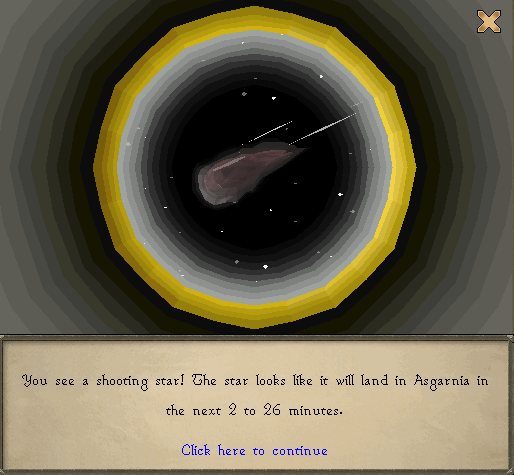 Every so often, a shooting star will fall somewhere in RuneScape. Mining from this fallen star will allow you to meet a Star Sprite who will reward you for mining it. The minimum skill requirement in order to play this game is level 10 Mining. A higher mining level helps, along with a House with portals and a telescope. There are different sizes of stars. Depending on the size of the star that you find, you will need to have a certain level. You will need to have a pickaxe in order to mine the star. The better the pickaxe, the more stardust you will receive from the star. Teleport runes are recommended, in order to get around to the landing places quickly. Wearing a charged Amulet of Glory while mining the star increases the chances to receive a gem up to diamonds. The shooting star can land in a variety of places. The faster you get to the location, the more stardust you can mine. If you arrive first, you also get a bonus of 75 experience per mining level that you have. You will also get your name put on a noticeboard in the Observatory. In Lumbridge swamp, 10 spaces north of the eastern mining area. South of the mine on the east side of Varrock. In the mine south of the west side of Varrock. South of Varrock's eastern bank, between the bank and the magic shop. 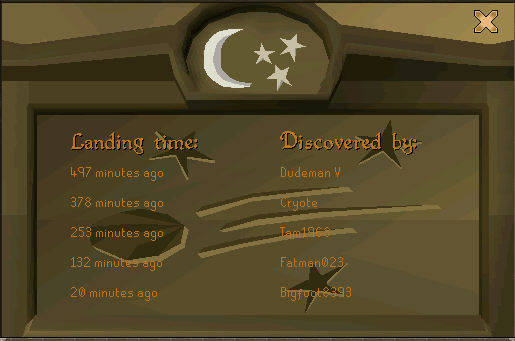 East of Falador's eastern bank / the Mining Guild. In the big mine near Rimmington. North of the dark wizard tower, near the mine due west from Falador. Inside the Crafting Guild mine. At the iron ores north of the Monastery south of Ardougne. Near the Mine southwest of the Legends' Guild. The mining spot north of Yanille's bank. At the coal trucks mine. In Yanille, between bank and Magic Guild. On Mos Le'Harmless, northeast of the docks. North of Burgh De Rott bank. Right outside the Canifis bank. At the mine south of cave entrance to Keldagrim. The mining site in the fenced of area of Rellekka. Near the coal mine on Miscellania. Northeast of Lunar Island's bank. Jatizso, right next to the mine entrance. Neitiznot, just south of rope bridge that leads to island the with runite rocks. Near the gem rocks in Shilo Village. At the gold rocks south of the entrance to Brimhaven Dungeon. On Brimhaven, near the northern gold mines, north of the summoning obelisk. This mine is shaped like a horse-shoe. The southwestern mining area on Crandor. The mine west of the Nature Rune Altar. South of Nardah by the river, or a little more north by the POH. Directly outside Al Kharid bank. At the mine just west of the Vultures. At the Duel Arena; literally right in front of the hospital area. The mine north of Al Kharid. Just southeast of the bank in Nardah. Clay mining area, east of river, north of Desert hunting area and Ruins of Uzer. Inside the city of Lletya, a bit south of the entrance. In the Gnome Stronghold, near the stairs to the bank in the middle of the stronghold. At the mining site just south of Piscatoris Fishing Colony. Near the rune rocks north of the Lava Maze. By the mining spot east of the Pirates' Hideout / Agility Area. Level 7 wilderness, near the mine near the Zamorak Mage. At the Bounty Hunter bank. At the Mage Arena bank. "To play this Activity, you have to find a shooting star that has collided with RuneScape To get a hint on where the shooting star will land, you can look through a telescope in a Player-Owned House. It will give you an estimation on where and when the star will land. The better type of telescope it is, the more accurate information you will receive." If you do not see a star in your telescope, that means a star is currently on the ground in your world. When you arrive at the star, you will be able to mine and prospect it. To find out what size it is, you will need to prospect it. You can also find out how far the star's current layer is mined through when you prospect it. When you can mine it, start. Whenever the size decreases, you will want to start mining again. This is identified by a cloud of dust and a collapsing sound. You will receive experience based on what size the star is when you mine it. While mining, you have a chance to find gems in the star. If you have mined long enough, you will eventually reach the max number of stardust, which is 200. Once you have reached this limit, you can keep mining, only to earn experience. Once a star has been mined through completely, a sprite will appear. You can talk to the sprite once a day to receive the rewards. After receiving the rewards, you will be able to mine 200 more stardust, but you will not be able to spend it until 24 hours have passed. The ability to mine extra ore from a single rock. 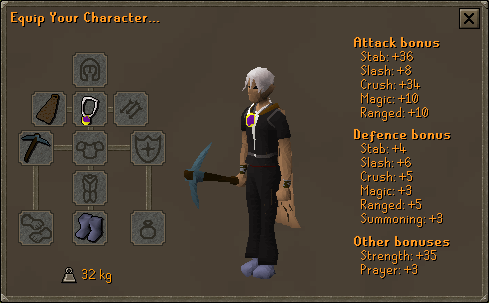 Using this while wearing Varrock Armour quadruples the chance to mine double ores. If you log out, the time will roll over.